As De Mee jumps to victory in the �22,500 feature race, the 3m 2f EDF-ER Limited Handicap Steeplechase (picture by Alan Raeburn). There were wins for local trainers Alistair Whillans, Susan Corbett, Rose Dobbin and Sandy Thompson at Kelso on Saturday, where division in two races created a competitive eight-race card. Craig Nichol took the ride on Some Reign, the impressive winner of the second division of the Ian Anderson Memorial Maiden Hurdle Race. Trained by Rose Dobbin, for her father and racecourse director Duncan Davidson, Some Reign enjoyed a comfortable 3½-length win over the Sue Smith-trained Treshnish. Local jockey Jamie Hamilton took the first division of the maiden aboard the Malcolm Jefferson-trained Temple Man, wearing the famous black jacket and mauve cap of winning owner Tizzy Straker. The racing public is quickly getting familiar with a set of highly unusual colours – an image of a black labrador on a white jacket with paw prints on the sleeves. The colours were designed by winning owner Deborah Thomson in response to a competition. 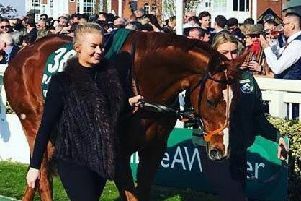 Thomson, who is a part owner of last season’s Grand National winner One For Arthur, has another talented individual on her hands in the shape of Big River. An impressive winner on his chase debut, a race won by One For Arthur in 2015, Big River is trained by Lucinda Russell, who said: “He is a different horse to ‘Arthur’ as he has more speed but he’s an exciting prospect. Aintree is on the agenda for As De Mee, after he romped away with the £22,500 feature race, the 3m 2f EDF-ER Limited Handicap Steeplechase. Sent off at 10/11, the Paul Nicholls-trained Somerset raider trounced Wakanda by seven lengths.Nicholls’ representative Andrew Doyle said he expected an entry in the Grand National too. Meadowcroft Boy was successful for Alistair Whillans in the Sir Maxwell Harper Gow Memorial Handicap Hurdle, while Sandy Thompson and Susan Corbett were responsible for Buckled and Reivers Lodge, the respective winners of the first and second divisions of the McConnell O’Hara Memorial Handicap Hurdle Race. Next meeting at Kelso is on Saturday, November 11.